You are here: Home / Travel / Scams / Beware of the Big Bad Baht Scam! Beware of the Big Bad Baht Scam! The first time I came across this, I got caught out because I was quite simply unaware. After paying a bill in the hospital with my UK credit card, I looked down at my receipt and saw that I'd been charged in UK Pounds and not Baht. 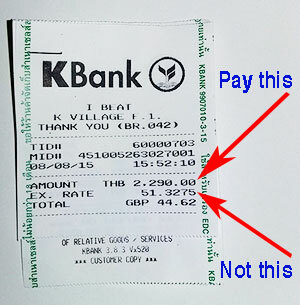 On that receipt was also the exchange rate I'd been given, a whopping 4 Baht per GBP less than the going rate – I checked this against my bank's (UK) rate on other charges to my credit card that week. Had I been charged in Baht, I'd have saved around 250 Baht. That's not a huge amount, but on larger purchases this would have a significant impact. The reception manager said the cashier should have asked me in which currency I wanted to pay before billing me. I guess she forgot on this occasion. I put this down to a one off, but since that time the same issue has come up three more times and seems to be getting more popular. For example, just recently I bought a new mouse from iBeat. On this occasion the lady did ask me whether I'd like to pay in GBP or Baht. I chuckled and said Baht. She chuckled too, indicating that she knew that I knew I'd pay less in Baht. When you're in a queue and a cashier says “Baht or GBP”, the quick, natural thing is to say your own currency; it's a kind of auto-pilot thing to do. It's almost like your brain says, “Cool, I get to pay in my own currency in another country”. But it's not cool. Because you lose out. Big-time. When you look at your receipt, you are fooled into thinking that the exchange rate on your receipt is what you would have gotten whether you'd opted for Baht instead of your home country's currency anyway. The exchange rate on your receipt is not what you would have gotten from your home bank once the amount was converted in your home country by your credit card provider. The amount on the receipt is the very low rate the Thai bank has given you on a conversion from Baht to your native currency. For example, look at the receipt below from iBeat. If I had accepted my home currency, I'd have been given an exchange rate of 51.32 Baht. As it was, being in the know, I chose Baht and my credit card company converted it at 54.56 Baht to the Pound at the other end. So I paid 41.97 GBP instead of 44.62 GBP, as it says I would have done on the receipt, had I chosen to pay in GBP. But here's what I am having trouble working out. Who profits from this? Surely the shop don't make anything because the bank just pays them the price in Baht. So is it the bank that makes a profit by pocketing the difference between the exchange rate they give you and the real exchange rate in Thailand at the time of purchase, which is much higher? Perhaps someone can enlighten me on this in the comments section. All I know is that it doesn't pay to NOT pay in Baht. I know it's not really a scam because 9 times out of 10 you will be asked first, so it is technically a personal choice, and the cashier isn't out to fiddle you (oo-er missus!) But I do think there is a lack of awareness about this and there ought to be more transparency. So, when asked if you want to pay in Baht or your native currency, make sure you say Baht. And if you aren't asked, it would be worth making sure the transaction is about to processed in Baht before it goes through and can't be refunded. **UPDATE: I was caught out again yesterday in Tesco. The reason I fell victim was because I'd been in there the day before and paid by credit card in Baht. But when I went back the next day, I paid, looked down at my receipt and the cashier had given me a rate of 53 Baht to GBP when the actual rate was 56! Below the conversion there was a 3% charge. I immediately asked to see the manager. She apologised and said the cashier should have asked me first. But that's the point. I never have been asked in Tesco before, and therefore never had a reason to check my receipt. So why is this suddenly happening everywhere? Are these innocent mistakes? Or does the weak Baht and falling tourist numbers have something to do with it? As far as I know, only MasterCard offers this service.TTL, you are right, people should always decline use of this service, because they always charge 3 %, whereas the foreign bank usually only does a 1,5 to 1,75 % damage. But yeah, that damage you avoid because you have paid in e.g. GBP and not a foreign currency. In addition using that service gives you a worse exchange rate on top. ATM also ask you about the currency you would like to be charged in. Same applies here! But the ATM fees (both Thai ATM + ATM fee from your foreign bank) will be charged regardless off the currency you selected. This is pretty common everywhere these days. But there are two things to do to beat the scam. And, to disagree with TTL, it really is a scam.First, you will always get a MUCH better exchange rate through your bank or credit card than you will letting a local bank determine the exchange rate. This is because the local bank will always apply their buy/sell spread to their advantage whereas a local currency transaction gets lumped in with all the other local currency transactions going back to your home bank and so you get a massive benefit of scale. In the US from both Chase and BOA I get very near the posted FX rate on credit card transactions (within a few 1/10s of a baht/dollar).Second, get a credit card with no foreign transaction fees. They might - might - have an annual fee but there are usually ways around this. Unfortunately, even if the transaction is in $, £, €, or Imperial Credits, it's a foreign transaction. I've been dinged before on a $ transaction, from a US company (Skype) whose headquarters are in some channel island for payment processing.My most recent transaction - 30/03/2107 hit me with a 34.37THB/$ exchange rate on a day when the posted exchange rate was 34.47. Not bad.Third (oops, I guess there's more than two), get a Thai bank account that way you can take advantage of anomalous pops in the exchange rate to save some money on transfers into the country. For example an exchange this week vs. last week would almost pay for the TransferWise fee. Once you've got some money in baht you can use the exchange rate to determine if you're better off buying with local cash/debit or using your no-annual-fee, no-foreign-transaction-fee credit card from wherever home is. Personally I have this issue only with ATMs... Thus I use credit cards as much as I can. Either Visa and Mastercard exchange me, something in between -1,2~1,3% compared to XE.com EURO rates... Don't have a clue why is that low (maybe because they are both prepaid cards? Mystery... ).When I exchange cash, it's about -0,5~1,5% (starting from SuperRich down the bank with the worst ratio). Take a look to the link below to get a picture: https://daytodaydata.net/BUT when using the same credit cards and a Maestro/Cirrus debit card on ATM, they lower the actual rates to about A FREAKING -5%!!! No to mention the 200b Thai bank fee and 2euro fee from my bank... Therefore, I use the ATMs only in case I have no choice at the very moment. Try to avoid them at any cost. I use them just about 3-4 times in a year, so the loss is still mild (about 150euro total loss for 20,000b x 4 times exchange).Then I just use credit cards like a madman and when I leave & back from my Country, I ALWAYS take with me 9,990euros in cash (max permitted cash is 10,000euros per time). Not to mention I refill the prepaid cards to their 5,000euro limit each. 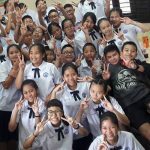 20,000euro are a plenty of money in Thailand for about 1 year, intermitted stay. The rates are terrible, but how do you keep all that cash safe? Safety deposit box? Could you not just open a bank account here and do one big transfer per year? With a retirement visa I would #1 Like to transfer money to a Thai account from my US Checking Account. What is the simplest and cheapest way? #2 As in the US, both savings and checking accounts were guaranteed by the FDIC in the amount of $100,000 USD and now it is $250,000. I am told there is an amount of guaranteed like this in Thai banks (DPA) but cannot find any reference to it on any banking site. What is the correct amount one is guaranteed in Thai banks? Coverage is limited to THB one million per depositor per bank. Don't exceed 1M per bank. To see the big picture, if you pay in the currency your credit card is based on, you pay no foreign currency exchange costs! In my case that is a 1,5 - 1,75 % fee for paying in a foreign currency.But sure: 3 % is way too much! Almost all Thai banks try to rip off falangs: That, 180 THB ATM fee etc. and so on. I have traveled throughout Asia, and found that Thailand is the only country where this is a problem.....which has caused me to wonder if the merchant does not stand to benefit (e.g. by receiving the foreign currency amount into their bank account at a more favorable exchange rate, etc.). It would seem that way. The main places it tends to occur are hospitals and Tesco, so I always stipulate that I want to pay in Baht now. I actually had this happen at a 5 star hotel in Phuket.The check-in girl stated "bill in US dollar, OK? "I didn't think much of it, but upon doing a little research after the fact found that replying "Yes, OK." to this question cost me $200 USD (on a $2500 hotel bill) in the form of unfavorable exchange rates and bank fees. That's a nasty hit to have to take. You should have got it reversed! This isn't just in Thailand, it's true all over the world. And whether you get a better rate is wholly dependent on the terms set by your home bank. For US banking customers, banks and credit card companies in the US charge fees varying from 0-5% just for US debit and credit card holders making a purchase in foreign currency, on top of the roughly 0.5%-1% spread over the wholesale exchange rate (though the trend with the higher end cards now is a 0% foreign transaction fee, and only the spread). Even worse, some of the more local, regional banks in the US might actually charge a *retail* spread to their debit or credit card customers (retail spread being more like 2-5% or more). So fees could add up to as much as 7-9% in the worst cases (though granted these worst cases are rare); typical fees in the 6% above wholesale are not uncommon. For many (though not all) transactions handled in a foreign country but in US dollars, some or all of these fees are reduced. Charging in home currency for those customers ends up being a rough wash over foreign currency (maybe 1-2% on either side), but with the added benefit (especially for non-residents) of easy math :)In other countries, especially ones where the banking system is only moderately developed, these fees can approach 3-7% of the transaction. Does this apply when paying for something online? I just recently (this morning) booked flights on airasia for some family in Thailand and at the website checkout I was asked if I wanted to pay in baht or my currency (GBP) and I clicked GBP. Now I wonder if it would have been cheaper if I paid in bahts? I have a few more flights to book so might try it the other way round next time. I should also probably say I used my normal bank card I use at home in England, not a Thai bank card.P.s. I stumbled upon your website while searching for information about opening a bank account for when I visit next year. I will only have a 30 day visa because unfortunately, even though I was born in Thailand, I have been in England since I was 6 therefore I do not have Thai identification card or residency and my Thai passport is God knows where. ? Hi Sai, it depends what exchange rate they give you. What I usually do when booking tickets is select Baht, then go to xe.com and see what the amount comes to in GBP. Then I switch it to GBP and see what the amount comes to and whether it is more or less than the xe.com rate.You will still be able to open a bank account, but it depends which branch you try. If you have a Thai family member to go to open it with that will probably help the process. If you have a Thai birth certificate, take that along. You can get an ID card by applying at the UK Embassy: http://www.thaiembassyuk.org.uk/?q=node/368 Contact them and tell them your situation. You can also apply for a Thai passport through them I believe. Hi Sai, yes, you can simply use an adapter for the extension plug, or get an adapter that has the right pins on it like this one. While I have an account with Bangkok Bank, which I route money to free from my PayPal account (via the US), I use a credit card for a lot of transactions because it is free for me. I don't pay any fees. The norm is to for a shop to charge in Baht and then I get a favourable exchange rate from my bank in the UK. However, more frequently shops are trying to sneakily charge in the buyer's native currency; that's what the post is about. No need to shake your head on my behalf; I'm doing just fine. There is no exchange rate involved with PayPal. I wire dollars to the US branch of Bangkok Bank. They send it on to Bangkok Bank in Thailand. The exchange I get once it arrives in Thailand is very favourable. 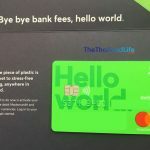 Interesting, is there really a solution to avoid this altogether other than paying cash or using a Thai credit/debit card? The simple solution, Eric, is to make sure you ask to be charged in Baht as you pay. Otherwise it's a hassle to have them reverse it. If the store is keen on charging in the native currency, most cashiers will have been instructed to ask you first and let you choose, but increasingly this is not the case, so it's always best to pre-empt this situation.